Seattle Sounders celebrate with the championship trophy at the end of the U.S. Open Cup final against the Philadelphia Union on Tuesday in Chester, Pa. 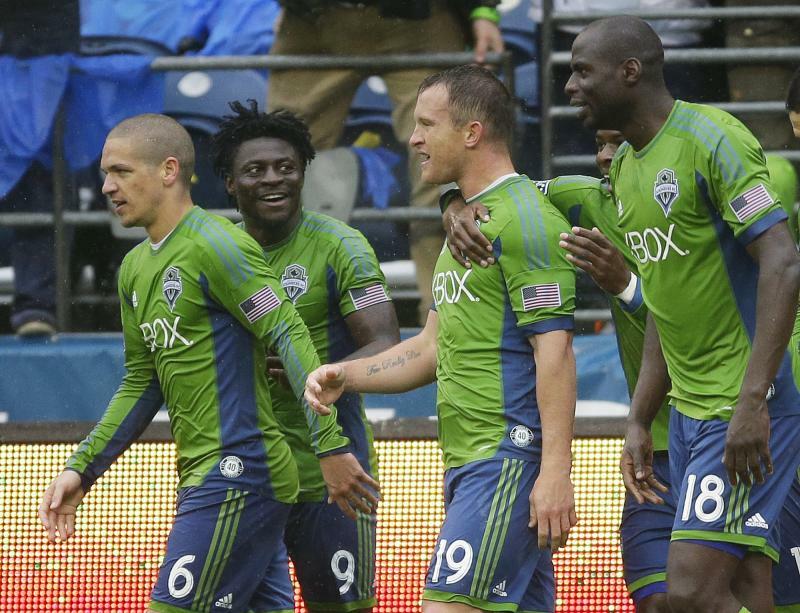 The Sounders FC beat the Union 3-1 in overtime. 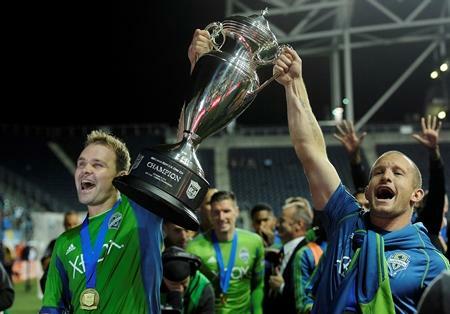 The Seattle Sounders won their fourth U.S. Open Cup championship this week. They also have the best record in Major League Soccer right now. KPLU sports commentator Art Thiel says the Sounders’ success has come despite several distractions. "This has been a fun time for most fans of any sport. I don't recall a month like this ever in Seattle sports history," Art said. The Super Bowl champion Seahawks have a Super Bowl rematch with the Broncos this weekend, the Mariners are in the playoff hunt and the University of Washington's football team is 3-0. "And here we have the Sounders who've basically run the table so far," said Art. "They lead Major League Soccer with 17 wins, seven losses and three draws, which gives them 54 points and the lead for the Supporters' Shield, which is the award that goes to the team with the best record. So, under the radar, they've been humming right along." 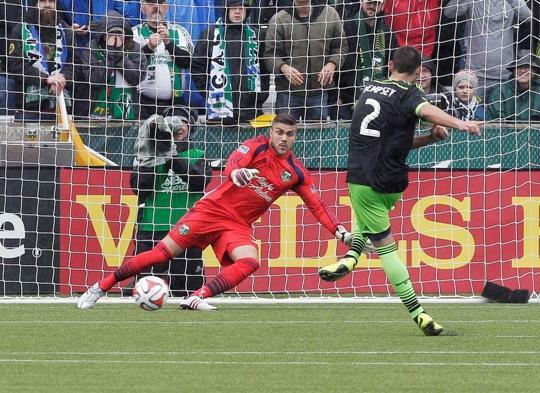 The U.S. Open Cup tournament took place in the middle of the Major League Soccer (MLS) season. The fact that the Sounders won the trophy while also staying on top of the MLS is "a real feat," according to Art. "The U.S. Open Cup has a 100-year tradition in this country and preceded the MLS. Well, now MLS has become the more important professional soccer league. And they still want to give a courtesy nod to this Open tournament, which is basically a club championship and it does feed into an international club championship. "The Sounders take pride in this. They've been in the championship of this tournament for five of their six years and they won their fourth title Tuesday, beating the Philadelphia Union 3-1 (in overtime)," he said. "This is a kind of tradition that's a part of soccer in Europe and Latin America where other tournaments coexist with the regular season schedule," Art said. "It's a little foreign to most American sports fans because the league schedule is always paramount in every other sport. But there are side tournaments in soccer that people want to give a lot of attention and credit to." Art says the challenge is apportioning resources. "They have to do right by the U.S. Open Cup and try hard, but they don't want to extend themselves so much they damage their MLS chances," he said. And then came the World Cup. The international event that happens once every four years took two key Sounders players away from the team for several weeks this season. "The Sounders really did well in the off-season because they staffed up with lots of deep talent," Art said. "People such as Chad Marshall and Chad Barrett and others who've come off the bench to fill in for Clint Dempsey and DeAndre Yedlin, who were busy with international duty with the World Cup." "They really haven't missed a beat. Sure they've lost a few games but nobody has managed the distractions and the international duties, and suspensions and injuries as well as the Sounders. That's why they're at the top of the league," he said. After the Sounders play the New York Red Bulls on Saturday in New Jersey, they'll finish out the season with six Western Conference matches. "The high drama comes at the end of the season," Art said. "The last two games are against the next-best team: the Los Angeles Galaxy. They're in second place right now in the Western Conference and the MLS. They're going to have the two best teams going at each other in back-to-back games to conclude the regular season. "At stake is not only the Supporters' Shield but the highest seed in the playoffs for home-field advantage. That is a big deal to the Sounders." You can find Art Thiel's work at Sportspress Northwest and Crosscut.com. 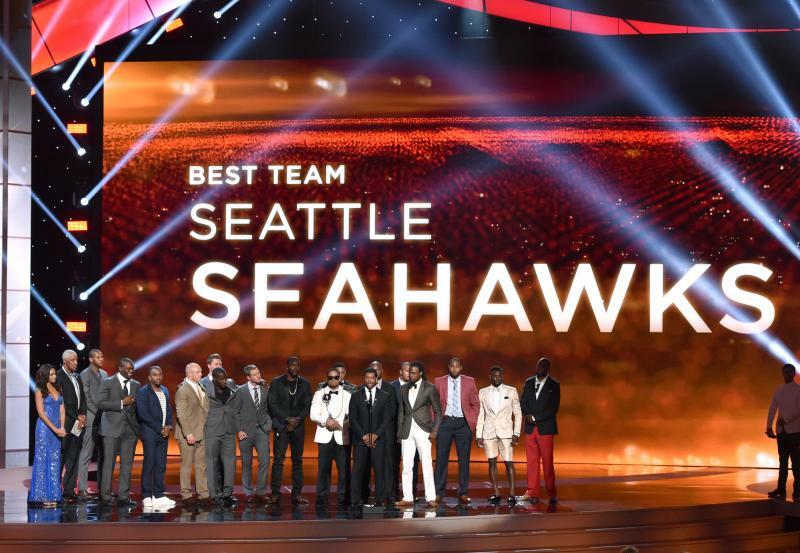 From Seattle Sounders players shining at the World Cup to four Mariners in the All-Star game, to the Seahawks winning best team in sports at the ESPY Awards, Seattle sports fans have lots of reasons to smile lately. And come September, says KPLU sports commentator Art Thiel, those smiles may turn into tears of joy. The Seattle Sounders are on top of the Major League Soccer standings heading into Saturday’s game against the Fire in Chicago. Then they’re off for three weeks while the World Cup is played in Brazil. Two Sounders players are on the men’s national team, which has taken them away from MLS play recently. But KPLU sports commentator Art Thiel says the Sounders have sufficient depth on their team to handle it. Sounders star midfielder Clint Dempsey has made headlines recently. He scored his first-ever hat trick two weeks ago against Portland. Dempsey has scored a total of five goals in the past two games, earning back-to-back Player of The Week awards from Major League Soccer. KPLU sports commentator Art Thiel says things are finally coming together for Dempsey and the Sounders. "Finally, it's happening. The investment is bearing fruit," Art said. 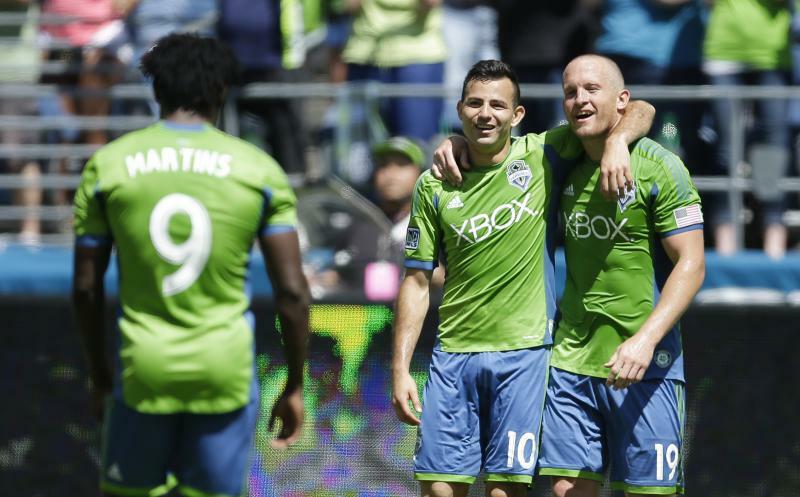 The Seattle Sounders FC host Toronto FC Saturday at CenturyLink Field. KPLU sports commentator Art Thiel says the team has undergone an “extreme makeover,” with new players making up half of its 2014 roster.